White Sails is named after a quote from a book, The Scarlet Pimpernel - “Silhouetted against the ever-changing sky, a graceful schooner, with white sails set, was gently dancing in the breeze.” When I read this quote years ago, I knew I would name my photography business White Sails. It summed up everything I hoped my business would be. It followed the description of a woman, stepping out on her porch, looking out to sea. It spoke to my romantic, dramatic heart, and played with my imagination. This photo shoot with Lisa & Stuart has brought that vision to life, all on their very own. This was no styled shoot, it wasn’t a drawn-out plan. It was Lisa & Stuart and real, honest, incredible love. 4:00am wake up - I hardly slept the whole night anyway, out of excitement. I had made a whole sunrise playlist for this very shoot, but once I got to our meet up spot and lay down on the stone wall, I knew we wouldn't need any music. It was warm, but dry. Not humid, not hot. With the most glorious breeze. It was unlike any weather I had every encountered, the most perfect weather. I wish I could take the wind, the weather, the sounds, and the feelings surrounding this photo and post it for you all. I can honestly still feel it. Lisa wore Stuart's grandmother's wedding dress, she altered it herself. Stuart is a carpenter, he made his cufflinks and their ring boxes. 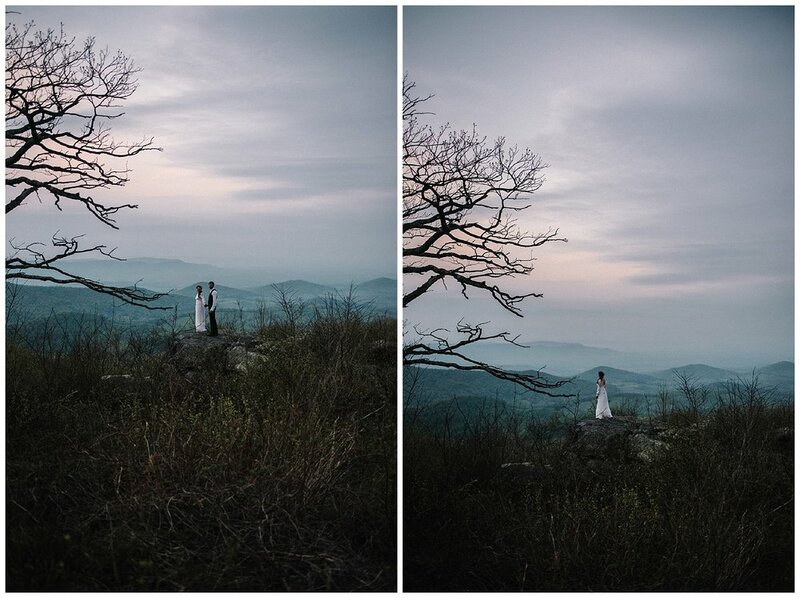 Their first date was hiking Old Rag - a pretty intense hike in the Shenandoah National Park. They were married 6 days before we took these photos. We listened to the birds chirping, let the wind take over. Lisa was barefoot for this entire photo shoot, and it made me want to be, too. It was relaxed - the actual wedding day had passed, but the excitement of being newly married still lingered. It was just repeating moments of calm and awe the entire morning - mixed with the sunrise. Sunrise is more changing and dramatic than sunset. It is the most peaceful experience. I will always be grateful for this photo shoot with these two wonderful people.